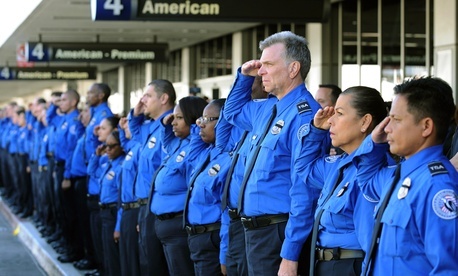 Should TSA Officers Have Guns? The House on Tuesday passed a bill that would require all Transportation Security Administration airport screeners to receive training on what to do in the event of an airport shooting. The 2014 Gerardo Hernandez Airport Security Act also directs the Homeland Security Department to work with U.S. airports on strategic plans to respond effectively to shooting incidents inside terminals. The plans would include emergency response and law enforcement strategies, evacuation for members of the public, and communicating with travelers during a crisis. The legislation, sponsored by Rep. Richard Hudson, R-N.C., was named for the transportation security officer killed in the line of duty during a November 2013 shooting at the Los Angeles International Airport. The Congressional Budget Office estimated that the bill would cost about $2.5 million in 2015. “Of that amount, CBO assumes the department would spend about $1.5 million to provide additional technical assistance to airports and about $1 million to evaluate the interoperability of communication systems used by emergency response teams,” the cost estimate stated. The House on Tuesday passed another TSA-related bill – the TSA Office of Inspection Accountability Act. That legislation would strip many Transportation Security Administration employees of a designation qualifying them for additional compensation.